We were less than an hour into our hunt when we spotted them. On waking up Saturday morning, my oldest son Bennet and I went straight to the canyon where we had found success the last two years. There's a real nice high ridge that we sit and glass from that overlooks the hot spot. 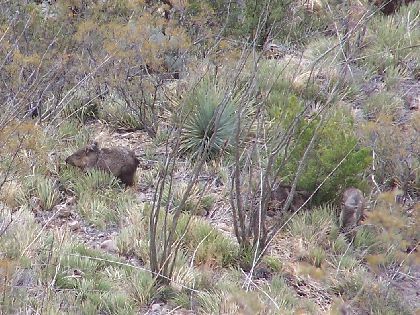 We had been sitting and glassing for only about 45 minutes when the pigs materialized on a bench just above the canyon bottom, below us about 125 yards away. Let's rewind a moment to last year: Ben and I had spotted the pigs feeding down in the bottom and were stalking down to them. Before we knew it, the pigs had come up from the bottom, onto the slope right in front of us only about 10 yards away. I was trying to give Ben hand signals to tell him to take his shot at Number One, but apparently he didn't get what I was trying to communicate. Just then, the pigs noticed us, and all of us, Ben, me, and the pigs, just froze. The opportunity to communicate any further had passed. I slammed the Russian scout rifle up to my shoulder, found Number Two in the scope, and punched a nice hole through his vitals. The hillside exploded with at least a dozen running pigs. I sent Ben down-canyon to try to find one to shoot at, but it was too late. The rest of the herd had fled the scene and would not come back over the next couple of days we hunted there. Ben never got a shot. The plan for this year was to give Ben the first shot, if and when we found them again. I would shoot at any leftovers when he scattered the herd. So when we spotted three pigs down on the bench below us, we started descending the steep slope to meet them. Ben asked where I thought he should go to set up his shooting sticks for the shot. Taking a look at the situation, a very steep slope, lots of loose rocks, pigs pretty close; I told him to forget about the sticks. There was a large rock outcrop half way between us and the pigs. 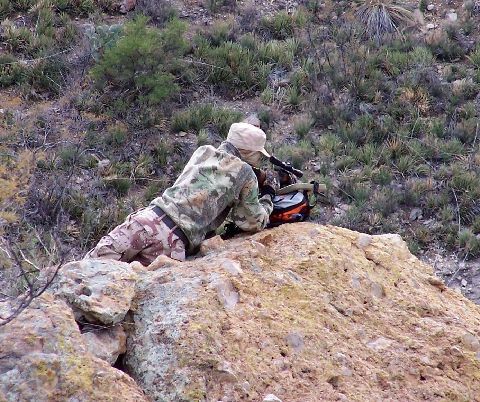 "Head for that rock, very quietly, and go prone on top of it, using your backpack as a rest for your rifle." At that point, I let him go forward to finish the stalk without me. I hung back and sat down to enjoy the show. I pulled out the camera and started snapping pictures. In a few minutes he was in position 70 yards directly above the pigs, waiting for the right opportunity. A few moments later, >POW< the T/C Contender carbine barked. As expected, the leftovers started scattering, heading down canyon, in my direction, but below me, as I was still high on the slope. I watched a string of pigs cross a low hump in the slope directly below me. Well, here was my opportunity. I left pack and camera behind where I sat, and took off down slope with only the rifle and my trusty shooting sticks. In anticipation of having to make a longer shot if the script played to plan, I was hunting today with a modern, highly-scoped bolt action, rather than with a handgun or with some 60-year-old battlefield relic. I gingerly made my way down slope to the hump that the pigs had crossed over moments ago. Looking off in the direction the pigs had traveled, I soon found at least one, in a hole in a field of green bushes just taller than javelina-size. I sat down, set up my sticks, and watched that hole for around five minutes. Apparently the pigs thought they were invisible because through the glass sight, I saw the skinny head of one looking directly at me, but unconcerned about running away. Finally, when I got a perfect broadside presentation, I squeezed the trigger. Once again, the leftovers fled the scene. Two went to the right, and one went to the left. Wait a minute! How many pigs were in there? I had great opportunities at those leaving, but held my fire expecting that there was one already laying dead in the bushes. Indeed there was! 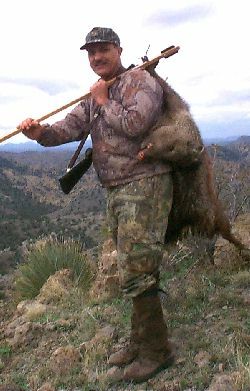 When I got to the scene about 75 yards away, there was one very dead, very smelly peccary in the thick brush. I pulled him up to a clear area where I field dressed him. I figured out a way to use my sticks as an aid to sling the piggy over my shoulder to transport him up and out of the deep and steep canyon. 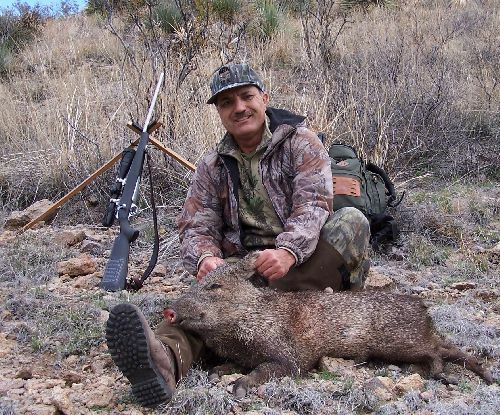 When I caught back up with Ben, he reported that he could not find a dead javelina where he had pointed his rifle. After depositing my piggy in the vehicle, we came back down, and I helped him search. Nothing. We came back to our high ridge overlooking the "pig farm" canyon several times over the next couple of days, but never saw the piggies again. We did see scavenging going on at my gut pile, but never saw scavengers on a dead pig that might have been Ben's. The best that we can figure, is that he just plain missed. The rifle I chose for this hunt is a Browning Stainless Stalker in .260 Remington. I acquired both this rifle, and the .260 Micro Hunter that my younger son Sam used on the Kaibab doe hunt, together in July of 2002. Browning last cataloged the .260 Remington in 2001. When I saw a dealer in Pennsylvania offering these two NIB .260's on AuctionArms.com, I knew that this would probably be my last chance to get a Browning A-Bolt (or two) in this caliber. I was right. With a black composite stock and stainless steel metalwork, this one is my "all-weather" rifle. The .260 Remington is a very pleasant shooting, deer-capable caliber. The one mistake that Browning made was to use too slow a twist, 1-in-10, in their .260's. Remington and Ruger both use a faster twist. As a result, The Browning's accuracy is not top notch with 140 grain bullets. I was mainly interested in using 120-125 grain bullets anyway. I wanted velocity in the 2800 fps range, which is tough to get with 140 grain bullets. The 120 grain .264" diameter bullet has a sectional density of .246, which will give you all the penetration you need in deer-size game or smaller. My favorite load so far for this rifle is the 120 grain Sierra ProHunter over 38.5 grains of IMR 4064, ignited by CCI BR-2 primers. I get 2780 fps with this load, though by book specs, I've still got some headroom to go a little faster if I wanted to push it. 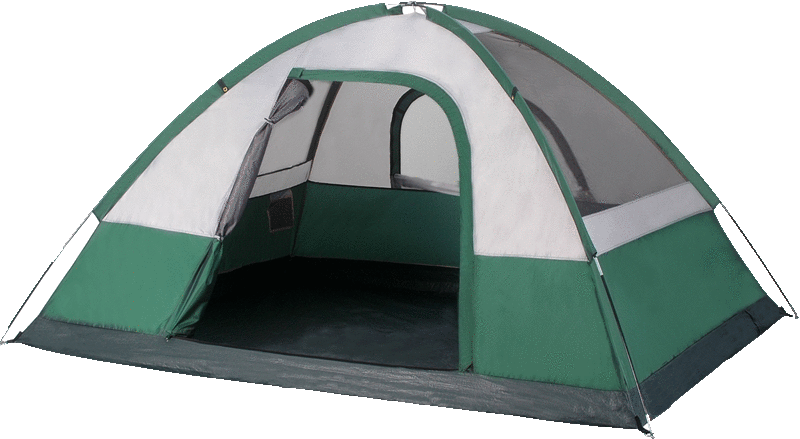 Groups are in the 1�" range. I can now verify that this load is a definite pig-stopper. I've scoped the rifle for long range shooting with a Weaver V16 4-16x42mm variable. I've got a 500 yard click-chart taped to the stock, but with only a 75 yard shot, I sure didn't need the ranging capability on this hunt.